Brice Cartwright chips onto the green for the Blue Lions during a match against Miami Trace and Vinton County Wednesday, Sept. 12, 2018 at the Greens. Caden Hott follows his drive down the fairway for Washington during a non-conference match against Vinton County and Miami Trace Wednesday, Sept. 12, 2018 at the Greens. 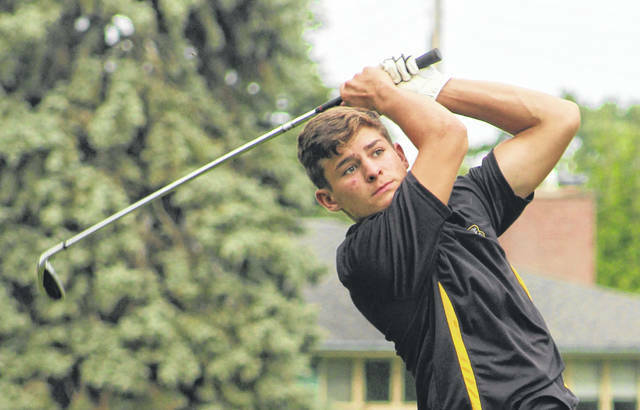 Washington’s Sam Shaffer watches the flight of his shot during a match at the Greens Wednesday, Sept. 12, 2018. Trenton Crawford putts for Miami Trace as a player from Vinton County looks on during a non-conference match at the Greens Wednesday, Sept. 12, 2018. Dalton Minshall tees off for Miami Trace during a nine-hole match at the Greens Wednesday, Sept. 12, 2018. Dawson Wallace watches his putt heading toward the cup for Miami Trace during a match with Washington and Vinton County at the Greens Wednesday, Sept. 12, 2018. 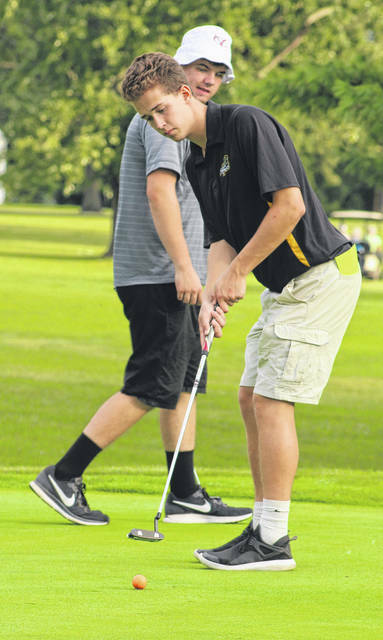 On an afternoon and evening when the sun returned after an absence of several days, the Washington Blue Lions and Miami Trace Panthers welcomed the team from Vinton County High School for a non-conference golf match at the Greens. Miami Trace won by one stroke, 195 to 196 for Washington. The Vikings of Vinton County shot a team score of 204. Tyler Eggleton of Miami Trace was the medalist with a score of 43. Ty Rose led the charge for the Blue Lions with a 44. Noble of Vinton County was low for his team with a 44. Also for Miami Trace, Hayden Walters shot a 47; Trenton Crawford, 50; Dalton Minshall, 55; Justin Marshall, 61; Dawson Wallace, 68. Other scores for Washington: Brock Morris, 49; Tyler Rood, 51; Brice Cartwright, 52; Sam Shaffer, 53; Caden Hott, 60. Other scores for Vinton County: Mason, 50; Hammond, 54; Montgomery, 56; Body, 57; Saylers, 58. There is a Frontier Athletic Conference match at Chillicothe Monday. 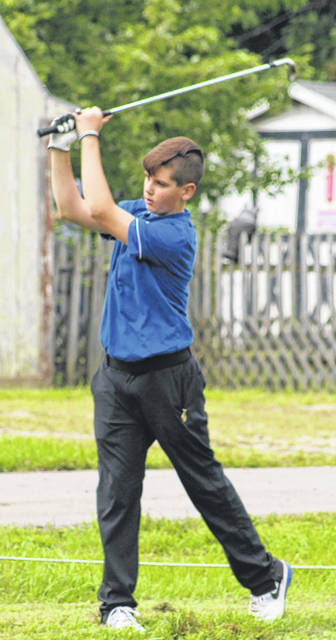 https://www.recordherald.com/wp-content/uploads/sites/27/2018/09/web1_Brice-Cartwright-BL-golf-9-12-2018.jpgBrice Cartwright chips onto the green for the Blue Lions during a match against Miami Trace and Vinton County Wednesday, Sept. 12, 2018 at the Greens. 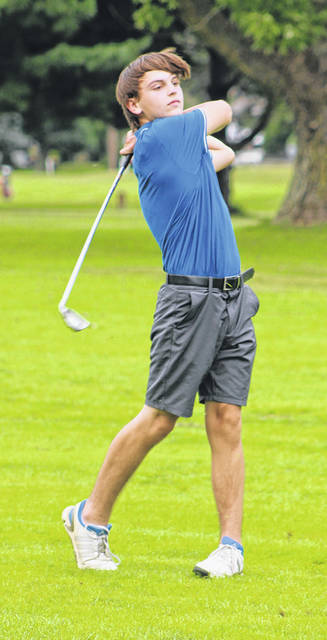 https://www.recordherald.com/wp-content/uploads/sites/27/2018/09/web1_Caden-Hott-Blue-Lion-golf.jpgCaden Hott follows his drive down the fairway for Washington during a non-conference match against Vinton County and Miami Trace Wednesday, Sept. 12, 2018 at the Greens. 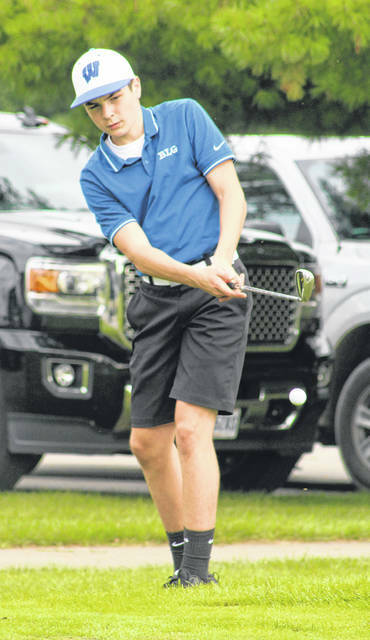 https://www.recordherald.com/wp-content/uploads/sites/27/2018/09/web1_Sam-Shaffer-Blue-Lion-golf-9-12-2018.jpgWashington’s Sam Shaffer watches the flight of his shot during a match at the Greens Wednesday, Sept. 12, 2018.
https://www.recordherald.com/wp-content/uploads/sites/27/2018/09/web1_New-MT-golf-no-3.jpgTrenton Crawford putts for Miami Trace as a player from Vinton County looks on during a non-conference match at the Greens Wednesday, Sept. 12, 2018.